If you would like to find out more information about Ronny or the Jetmore Insurance Group visit https://jetmoreinsurancegroup.com. You can subscribe to the podcast with your podcatcher of choice through itunes, Microsoft catalog, stitcher, or the raw feed url. Its free and you don’t need dial anything. Press the record button and begin. It will use the microphone built into your laptop, tablet, smartphone, etc. When the recording begins please state your name, city you live in, and message. Thanks so much and you may just hear yourself in in our next show. You are listening to the YourCalvert.com Calvert County lifestyle podcast (episode number 10). 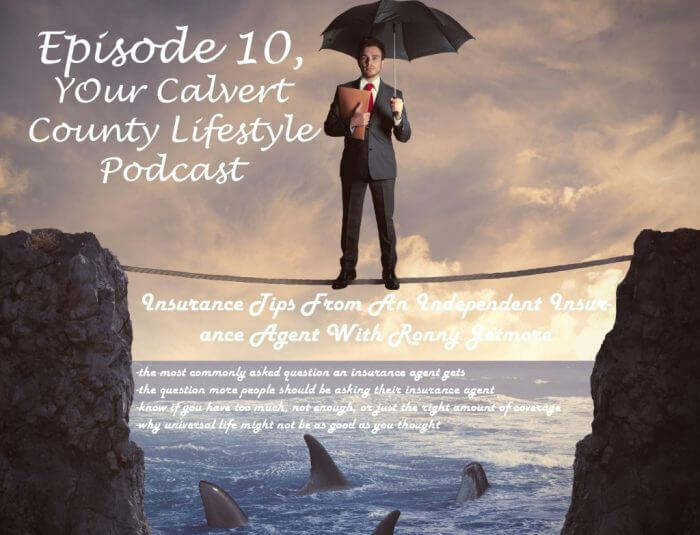 In this episode, I’m joined by Ronnie Jetmore of the Jetmore Insurance Group, an independent insurance agent based in Lusby Maryland. In this episode, you’re going to learn the most commonly asked questions an insurance agent gets, you’re going to learn the questions that more people should be asking their insurance agent, you’re going to learn how to identify if you have too much coverage, not enough coverage, or just the right amount of coverage. In addition you’re going to learn some tips about you know home insurance, auto insurance, life insurance and ways to save on all of those why Universal Life in variable; Universal life might not be as good as you thought and what you should do instead if you have one of those policies already. So stay tuned! You can find the show notes for this episode at YourCalvert.com/10 on that page will be able to find any links or anything else. We’ve talked about during this episode. Welcome to the Calvert County lifestyle podcast. The original podcast exclusively for Calvert County and dedicated to helping you get the most from the place you love to play. Listen for the latest events business in real estate updates interesting interviews and more than here’s your host Clif Bridegum. Clif: Good morning. I am your host Clif Bridegum. So Ronnie why don’t you come on and tell us a little bit about your background. Ronny: Well actually I’ve been in the insurance business for about fifteen years started working for one of the companies where you basically only sell for one insure and that was fine, that was OK, you’re pretty limited and sometimes you’re trying to fit a round peg in a square hole. You know what one company simply doesn’t have the market or appetite even for every risk and so that led me to the independent realm where there are many companies competing for virtually every type of business. If there’s an insurance risk that some company and more than one company are wanting that risk. Clif: So what kinds of insurance do you offer as an independent insurance agent? Clif: So Ronnie you talked about being how you transition to being an independent insurance agent but why don’t you tell us a little bit more about maybe why exactly you switched and what some of those benefits that you’ve realized to being an independent insurance agent. Ronny: In the big picture, people simply want…. whatever their risk is whatever they have to insure they want it insured properly and they want it insured at a competitive rate; with independent agent, we can we can find normally multiple companies that will insure a given item and in that process we can go from there in the side well this company offers the best benefit at the best price or if somebody just wants the best price we can do that or somebody says you know sky’s the limit, just give me the ultimate policy, we can do that as well you know that’s by far the biggest benefit because oftentimes you know, you go to an agent that sells for one company and to be frank even some agencies that claim they’re independent, they may only sell for two or three companies possible I’d say even probable that with just two or three companies they can’t possibly offer a great deal for every risk which is why we really try to have a lot of companies competing for every risk that comes on our door which is how we maintain a competitive edge it’s how we’ve grown through every year even of the recession. Clif: So how many companies how do you actually represent or do you work with on a normal basis. Ronny: We sell for a little over thirty insurers on a regular basis. Having said that there are probably eight or ten that we use very regularly; the others we still use just not all the time, we typically find that most nine to ten risks will fit within that the parameters of say the ten companies or so and then when they don’t. That’s when the other companies come into play. Clif: Alright Ronnie, some sure people are thinking now that as an independent insurance agent you’re not an employee of that particular company, so how exactly do you get paid and does that have any conflicts with what you’re providing? Clif: I think it does and also you can even think about it as a new customer coming to you could become loyal to you, that way you’re the loyal person they can stay with you forever and you can quote whatever policies they need from whatever company. Ronny: Well that’s correct! and in fact as a case in point, just yesterday I had a client calling me who has insurance with us for many years and he wanted a quote on a new recreational vehicle he was buying, and you know I could have placed him with the same insurer that he has his home and auto with; but I didn’t because I knew right off the bat, based on his description of the vehicle that it wasn’t going to be nearly as competitive as he’s replaced his recreational vehicle with another company. So I went straight to the company of course the customer says, well you know hey! Why aren’t we using the company already? And I said Why can it is going to be another five $500 a year and the coverage isn’t quite as good and of course his response was good job. So, that’s why he’s paying me. Clif: So what is the most common question that you guys are asked as an insurance agent and then let’s talk about what’s the question that you feel people should ask you more? Ronny: Well… OK, that’s a good question. Probably the most common question it doesn’t come out this way but this is what they’re asking (Can you do equivalent coverage at a better price?). That’s probably in a nutshell. When they call, it is the most you know the most frequent question is going to be around that that first phone call that hey I’m shopping for insurance. Not always, but normally when they’re shopping, they’re not looking for more coverage, they’re usually looking for a better price, in the process I try to deliver both, you know explain if there are some serious deficiencies in their present coverage. You know I definitely give them an apples quarter to what they currently have but then I explain to them, hey! look you only have X amount of coverage for this liability to me this is a very dangerous thing we can raise that coverage, in an ironic sense oftentimes we can raise that coverage and it can cost less; there’s a process in doing that but we can do that which is and it’s quite frequent but nobody oftentimes explained all the benefits and all the reasons why you would do certain things for coverage but you know at the end of the day, Yeah! the first question without a doubt you know can you save me money and forgive me what was the second part to that? Clif: The second part was what question should people be asking you more? Ronny: Yeah I think the biggest thing would be… and I get this once in a while but to be frank but it’s very rare but once in a while somebody would ask the question of hey what coverage should I have? I mean that’s going to be without a doubt that’s going to without a doubt the biggest item because at the end of the day if you can make those payments that’s the important thing to be able to keep the coverage active. But if the coverage isn’t there that you really need for the upgrades or the extras or the endorsements and riders on your policy that are important to; the policy then simply hasn’t served you well. And typically to get the coverage you want going from a basic policy of any type, typically the cost difference is minimal; most of these coverages that people want or want to be certain they have or really need in a time of need could have been purchased for very little money. The greatest cost as it is the basic policy itself; it’s those extras or upgrades that sometimes… I don’t want to impugn the motive of the agent. But maybe didn’t explain or go through all of the different options because it takes a lot of time or maybe they’re just trying to sell the cheapest; i don’t know but I do know that it is quite frequent that people could have had coverage that they really would have liked and used for a nominal fee. Clif: Thanks Ronnie and now let me jump back to one more piece of that most common question when people are shopping. I know people can go online and shop for quotes and come up with all kinds of stuff but what is your kind of take on that and where have you seen those downfalls that people are getting themselves into? Ronny: Sure… To be honest with you, if you understand insurance thoroughly… what I mean is if you’ve either really carefully researched it, perhaps you hold a license and you’ve stayed on top of the newest coverage and the lack thereof; if you’ve been an agent that kind of thing, you know you honestly could you could shop online you could do that. I can honestly tell you that it doesn’t benefit me in one way but I can still tell you, if you really understand the coverages thoroughly, there’s nothing wrong with that but I do find that the vast majority of people don’t fall into that category. Ninety, eight percent of the population is probably never worked in insurance in any capacity so I don’t think they would be qualified to do that and what I see is when people buy online or with a company where it’s purely a phone conversation to purchase the coverage, I see it frequently where the insured or the applicant comes to me and says “I have a quote and I bought one of these policies online or over the phone”. I regularly see typically actually where the coverage is lacking in many ways and I explain that to the person and they acknowledge that nine times out of ten; so I had no idea you know a couple of the companies that I’ll leave unnamed but a couple that I know of you know… you have a guy that makes a good living has a lot of assets and yet he has the minimum liability coverage on his auto the minimum allowed by law and that is to say you know if he hits someone else in an accident and it’s his fault he only has $30,000 for their bodily injury, anything beyond that is, he’s going to be sued for. In my view, especially because it is a very minimal cost, that’s just unacceptable, I mean the average person that in that situation, the average consumer, that’s not serve them if it was explained then they would not have purchased that; I see it as maybe you know you get a consumer that possibly calls one of these companies and says “I just want cheap” and they just go from there with just OK “Here you go, here’s cheap” and they don’t break down the coverages at all. I just think it’s very dangerous territory because of that kind of a thing and of course the liability is the biggest area of concern because you know obviously no one wants to be sued; if you are sued for something that you caused, you ought to have enough insurance. So you know when I see the guy with the three $3 million dwelling and $400,000 in automobiles and he has $30,000 in liability coverage, you know I think this guy really doesn’t understand what he has you know. Clif: So the real keys are saying are to obviously insurance is to protect your risk as a consumer in whatever you’re trying to do right? And you need to make sure you have enough coverage in place to protect his risk but obviously not overpay for something that isn’t useful to you? Clif: So Ronnie now let’s go ahead and just we’ll go through a couple tips from each of the different areas of insurance that you can help people with. So what are some kind of tips for life insurance we’ll start with that one that people should be aware of? Ronny: Sure sure…. You know this is probably, in fact this is without a doubt, the biggest area that I see the average person vastly overpaying; and I’ve seen it in from all walks of life, I’ve seen it from the average person up to a seven figure Wall Street client without the biggest universal life. If perhaps, someone has a universal life policy which is a policy which is sold on the idea of having a flexible premium and earning interest. But it’s a noted fact, any financial planner that is a true fee only financial planner in other words they’re not selling you anything but advice any financial planner as well as any consumer focused magazine again not selling product but selling advice. Every one of those would tell you the same thing and that is in a just buy term insurance for a certain number of years you can buy a term up to thirty years buy that policy and invest the difference you saved over the universal life. And now the new… I guess the frequently touted product is the variable universal life. A lot of people that are financial planners that do sell products which in my view is a conflict there, but a lot of them will often sell the variable Universal Life again, if you go to your consumer focused finance magazines, again they’ll all tell you and it’s very clear (you can read the numbers….I have articles on this) that the variable universal life still does not earn the customer or the client the money the same amount of money as simply buying term and investing the difference. Again I you know I can’t speak for the agent why they sell that, but I but I can say that that’s very clear, very obvious and again someone selling only advice that understands finance would tell you the same thing. You know that’s the biggest area I see average people that are with modest means spending extraordinary money for their budget. Two, three, four hundred dollars every month on a policy where they could have gotten better coverage, more coverage under a term policy at say $100 a month or less and invested that difference and made a lot more money on it; it’s definitely not a victimless insurance purchase, you’re simply not getting all that you could had you really understood what you’re buying in a universal variable life policy. It’s simply not serving you as well as it is the insurance company. Clif: Very insightful tip Ronnie, thank you so much for that. So, let’s move on to any kind of tips for home or auto that people should be aware of? Ronny: Yeah I think probably you know the biggest thing that I would have to say regarding uhm… just a simple one on the home is as much as you can afford it, raise your home deductible, that’s probably the absolute largest area where I see a lot of waste. Raise that deductible to as high as you can financially stand and the reason is simple with the economy as it is now with the storms we suffered in this region over the last few years, the insurers aren’t making money hand over fist and so when they see a claim even if it’s a very minor claim, they will definitely look at that risk a little harder. You know and the statistics show if you have one claim you’re more likely to have a second, than the person that doesn’t have any so, if the company is just looking at future profitability or losses, they’ve got to consider even if you made that one claim that only paid $800, so the point is it’s just we’re in a climate where companies can no longer afford to pay out on small claims and insures those that hold the policies can no longer afford to make those claims. So if you can afford a thousand dollar or better twenty five hundred dollars deductible, do that. You know you will save a little bit of money each year and to be frank, if you’re very careful in your risk, you will save money over the long haul; even if you’re only saving one hundred dollars a year over a twenty year period that’s a couple thousand dollars, so whatever you can do to self-insure that is money you’re not paying the insurance companies, do that on the home on the auto probably without a doubt, I have to say the biggest tip is not having a low deductible on your collision coverage, in other words you know if you have to make a claim over… a you know you back in the something the way you want or you back into something the driveway or are you or something very minor occurs, that collision claim where the insurance money pays out two or three hundred dollars that is definitely going to impact your rate I can almost guarantee it for the next few years in a far greater way than the money you received from the insurance company on that claim. So if you can afford it to raise the deductible in the collision the five hundred or a thousand; if you can that will definitely help you, it will it will bring your rate down significantly. Comprehensive rate so happens oftentimes you can keep that comprehensive coverage with a low deductible at a similar rate to having a high deductible; comprehensive claims a little different, that’s where you say hit a deer or a branch falls on the car or the cars vandalized, around that kind of very big item… but those types of claims unless you have many of them, they tend to not impact your rate. So those oftentimes you can’t get away with having a low deductible on that one again you don’t want to have two or three comprehensive claims in a short period of time but with a low deductible if you’re only paying another 20 or 30 dollars a year….uhm…. but it’s going to pay another thousand dollars or so in the event of a conference of Claim it may be worth keeping and then I guess the final point would be kind of a synergy there between the home and auto, you know it’s a wise move and I’ll say two things here that may seem a little contradictory uhm….but they’re not, I’ll explain; it’s a wise move to shop the home and auto together, It is also a wise move to shop them separately and what I mean is very simple. Often times if a company has to quote your home an auto, they will give you an excellent rate by having the two together even if maybe the home is a little expensive or the auto is a little expensive in and of itself, by putting them together there awarding a tremendous discount. Having said that, the flip side of the coin is also true; sometimes it truly is cheaper to have your home with one company and auto with another. It does occur, I have been in that situation myself where it was far cheaper, I had a tremendous tremendously cheap rate on my auto and it was so cheap that even if I combined the home in order together with another insurer It could not make up for a how great of a deal I had with my auto; so I had them split apart. Now it so happens rate changes occur things happen and it is actually cheaper for me now to have them in order to get it but my point is, don’t be afraid to diversify, that would be probably the lesson learned there. Honestly insurance is one of those things… kind of like interest where if you’re going to save, if making a few changes, asking some questions can save you three four five six hundred dollars a year. You know that’s going to be over the next ten twenty thirty forty years; that is a lot of money to be leaving on the table for someone else. Clif: So always just have your agent quoted both ways and figure out which works best for your specific situation? Ronny: Exactly! and I think a good warning; I don’t know if it’s a fair word to use but any independent agent, I think that’s really trying to shop the best deal for that truly does have several companies from which to quote or to offer. I think that agent will probably do that on his or her own. I do it every time in our office we do that where we have someone’s information, they want to call it the home and auto and to be frank it takes some time it does. I can’t just give a quote over the phone, some people can but all I can say is there’s no way they’re shopping all of the possibilities for you if they’re doing that. So I shop in pieces home and auto apart and then I shop them together and that’s how we arrive at the best deal; if it’s a close tie I course I present that to the client and say “hey you know we can do company A for this policy company B the other” and oftentimes if the rate is close, they will place them both with the same company and that’s understandable to me if it’s going to save them three, four, five, six hundred dollars a year, they oftentimes will break the policies up. Clif: Sounds like a very good advice, do you have any other kinds of tips that you’d like to give for business insurance, is there any kind of anything like talk about? Ronny: Yeah! I would probably have to say the biggest area that I see especially in the trades. Anyone that does any kind of physical labor in their business and this goes for any business but especially for the trades because it is so physical; it is you know disability long term disability insurance is very expensive for the trades. If you’re in the office it’s not nearly as expensive because of the type of work you’re doing, but if you are in the trades, I would highly recommend anyone to try and get a quote or to strongly consider a long term disability. Everybody seems very interested in the short term disability, the long terms are not so much. But all I can say is, I’ve seen instances, we’ve had those instances where someone was seriously injured, couldn’t work for a period of six or eight years and they got their check every month you know three, four, thousand dollars every month the entire time and that’s the person that will never go without disability insurance again; they’ve seen the value in it, for whatever reason it’s escaped the attention of the media and popular magazines, it’s just one of those things that’s flown under the radar. But you know back to the fee only financial advisor or consumer based magazine; every one of them would tell you the same thing. Consider the long term disability, yes it’s going to cost you some money because it can pay the age of sixty five but you know to be to be blunt, what are your financial plans if you can’t work for the next twenty years? That’s really how that has to be looked at. And again this could happen with any line of work, but as specially the trades I do see that as a major problem just because they need their back, they need their legs, they need their arms and hands; they need to be able to do their job. Clif: All right Ronnie. So before we close out this interview, what’s one thing that you like most about Calvert County? Ronny: I definitely have to say that the biggest item would be family, pretty much my entire family is within the area that that would be it for me; if I could name a close second I’d have to say the I have to say the river but that’s a river I do as a kid you know we did a lot of crabbing, fishing. Now when I get out there, I like to have a good time with with the boat and just run around a little bit but yeah family than water and I have to say yeah. Clif: So before we close out now , I’d like you give people more information on how they can get in touch with you, so where would you like to send people? Ronny: Sure sure… you can either give me a phone call or visit my website my number is 4103949000 and my website is www.Jetmoreinsurancegroup.com and @JET isn’t Tom and isn’t Mary. Oh Ari insurance group all spelled out kind of a long one and yeah you can email there. I can say we’ve never liked very pushy salespeople , our office doesn’t operate that way if somebody simply wants to talk, if they want to quote or discuss something, I give them that I do not hand anybody about, you know you really need to buy this… none of that is done, this is what we have to offer and I’ll explain if it’s better. It does happen where I’ve told people that you know hey we can’t do any better, you’ve got a great deal, you’ve been there a long time I would just keep what you have and I’ll tell you that if that’s the case if I can help you and I can help you greatly make sense that you would move that piece of business to us, but again no pressure. Clif: Thank you Ronny and thanks so much for coming on the show today to share this valuable information that you’ve given us with your calvert community. Ronny: I appreciate what you guys do, I appreciate that! Clif: Thanks for listening to the YourCalvert.com Calvert County lifestyle podcast. You can subscribe for free to all updates that your Calvert does at YourCalvert.com/go that will take you to live subscribe page to listen to a bunch of reasons of why you should subscribe. Once you do that you’ll get daily email updates from everything that we release to the blog including all podcast episodes as well, delivered directly to your inbox free of charge. If you’d like to subscribe to the podcast episodes only, you can do that via iTunes, stitcher, Microsoft or the raw feed U.R.L. is listed on our website as well. So to subscribe for iTunes that link is YourCalvert.com/Apple that will redirect you to the iTunes page where you can listen to our episodes there as well as subscribe, so our future episodes are downloaded directly to your device. Next up is stitcher, stitcher radio you can go to YourCalvert.com/stitcher and that with redirect you to distance your page where you can subscribe. In addition we’re also in the Microsoft catalog. If you’d like to leave feedback for the show you can do so on the show notes page that’s YourCalvert.com/the episode number just the numeral… so any episode that it is it’s YourCalvert.com/that episode number. To leave a comment on that page, just scroll down to the bottom; you’ll see a little box where you can enter into any comment of your choice. If you’d like to leave a comment via voice you can go to our voicemail page which is YourCalvert.com/V M and that will allow you to record a voice comment it’s not a hotline, it’ll let you record using your computer or the speaker in microphone on any of your mobile devices.I would also like to thank each and every one of you that has shared the podcast or any website with your friends and family and we truly appreciate that you continue to share the work tell your friends and thanks so much , see you next week. Clif Bridegum is the founder of Your Calvert and also owns a marketing agency, Your Digital Salesman, that helps small businesses get more customers. He has lived in Calvert County his whole life. Learn more about Your Calvert and Clif at https://www.yourcalvert.com/About or follow me on G+.